Studies have shown that the use of protective equipment when handling chemicals reduces exposure to potentially dangerous substances. 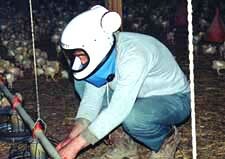 A Kasco Helmet, Spray Suit, Nitrile Gloves and Boots will give you a higher degree of protection. Kasco is a world leader in powered air purifying helmet respirators. Why gamble with your health? - it’s good common sense to make the KASCO system standard practice in your operation. The St. George Company provides all parts and service for Kasco respirators. Get the insurance of healthy protection - order a Kasco helmet respirator today!